The musical version of Jack Heifner's 1975 play received an unexpected boost from the zeitgeist this week when the appointment of John McCain's 44-year-old Vice-Presidential candidate, Alaska Governor Sarah Palin, sucked the breath out of the airwaves. Going from network news to The Pasadena Playhouse may seem like a stretch but Heifner showed just as much interest in exploring Fascinating Womanhood as CNN. Heifner's play follows three Texas high school cheerleaders from 1963 through their college sorority days to reunions in 1974 and 1990. They are Kathy, captain of the cheerleaders, a strong believer in "The Organized Life", rebellious Mary, whose mother is an alcoholic and Joanne, a conventional airhead whose ambitions are to be a wife and mother. Act I bubbles with trivia and superficiality as the high school cheerleaders prepare for the big game. Their reaction to President Kennedy's assassination consistes of blank-eyed stares as if they're wondering what they're supposed to feel. 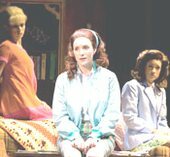 In Act II the women are college sorority sisters, with Kathy geting her heart broken in one of the show's best numbers "Cute Boys with Short Haircuts. By Act III she's a writer, ensconced in a glamourous New York penthouse, and entertaining her two old friends. None of them knows quite why they're meeting and that question is never answered. What does surface is Joanne's hatred of Mary who has always needled her.< Heifner and composter/lyricist David Kirshenbaum have added a fourth scene which puts a different spin on the women's friendship, at the expense of making it a Hollywood ending. The most fully-drawn character is Mary, here played with acerbic elegance by long-legged Lauren Kennedy whose splits drew applause all their own. Anneliese van der Pol brings a warm vibrant voice to Kathy and fully inhabits a rather mysterious character who doesn't know what she wants and passively goes along with her boyfriend's wish to use birth control until he impregnates and marries another girl. Joanne, who is ditzy adorable in her cheerleader outfit, seems narrow-minded and unenquiring. The last scene does give her a chance to grow. In the performance viewed, understudy Elizabeth Brackenbury took over for Sarah Stiles as Joanne. She did a valiant job and has a fine voice, though she couldn't overcome the clichés in the characterization. Kirschenbaum's music seems true to the period and the lyrics give it almost the air of a sung-through musical. Very few of the songs are memorable but they drive the show. Anna Louizos designed the excellent set in which three vanities with mirrors give the women a chance to dress, undress and examine themselves in solitude before plunging into the group activities they live for. Paul Miller produced a delicate lighting design and Joseph G. Aulisi's costumes were appropriate and, in Mary's case, stunning. Judith Ivey directs with a sound instinct for making the most of the limited material. She knows how to listen for the humor without missing the sorrow. Reviewed by Laura Hitchcock on September 2, 2008.